Pool Design Houston: Why Use Hip Pools For Installation and Cleaning? 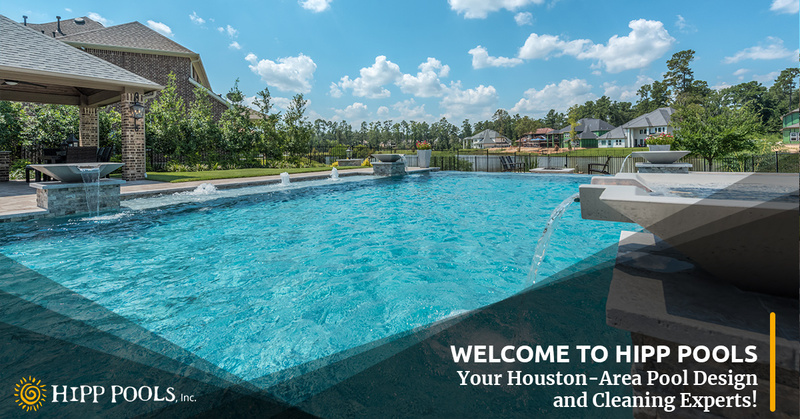 Welcome to Hipp Pools, Your Houston-Area Pool Design and Cleaning Experts! We’d like to thank you for stopping by Hipp Pools, serving Spring, The Woodlands, and the entire Houston area. Our new website is here to make working with us as easy as possible while showing you exactly what we offer as pool designers, installers, cleaners, and repair and maintenance experts. While our website might be new, our business has been around for more than 15 years. During that time we’ve been serving the Houston area with gorgeous pool designs and keeping those pools clean. As our first blog on this new site, we thought we’d tell you about the services we offer (and let you know why working with Hipp Pools is always a good idea!). Swimming pools are incredibly important to many people, and it makes sense considering the heat and humidity we get in this part of the country. Swimming is also one of the healthiest sports there is, since it’s low-impact while getting the heart going. And it’s just plain fun! While some people are perfectly happy with a traditional rectangular pool, others are much more interested in pool design that doubles as landscaping. If the pool is a key feature of a backyard, why not make the most of it? A custom pool adds to the look of the yard, and custom features can really make it stand out for the homeowner and guests alike. At Hipp Pools, we specialize in custom pool design. This means designs that create a space that homeowners looks forward to every time they step outside, one that makes them feel like they’re at a resort that’s just feet from their back door. Our pool company can suggest swimming pool designs that fit perfectly into the landscape, including swimming pool water features that most customers have never even thought of. Our experience means a better pool in the end. And let’s not forget about custom spas. If you are having a custom pool installed that perfectly matches the house and the landscape, it doesn’t make sense to just put a hot tub on a pad and call it good. The spa should be just as special as the pool itself, and even complement the pool while creating a warm, relaxing atmosphere away from the hectic swimming pool. We can make that happen. When you have pool installation performed, you don’t want to cut corners. You want expert pool builders who will be able to build you an excellent pool that will last for years. That’s exactly what you get when you work with Hipp Pools. Pool building is much more complex than most people think, especially when it’s a custom pool with water features. The digging, the pool installation, and the plumbing all have to be installed perfectly in order to make sure that every step is done correctly the first time. All of this should be done in a timely manner while disturbing the surrounding landscape as little as possible. If you’ve spent good money on a pool, you want to be able to enjoy it as much as possible. It’s just no fun to get in your swimsuit and head outside one morning only to find out that your pool water doesn’t look or smell like it should. On the other end of the spectrum, you also don’t want your pool to be overtreated. A pool service that tosses some shock pellets in and calls it done isn’t giving you the kind of pool cleaning you want. To overtreat a pool can be just as bad as undertreating it, because you could come away from your swim feeling like you’re covered in chemicals and dealing with red eyes for the rest of the day. Pools are so much more than just holes in the ground filled with water. Every pool contains complex electrical and plumbing systems in order to keep everything running properly. And like any machine, these parts can wear out over time. But before they need repair, there’s something you can do to make sure your pool is usable without any interruptions: pool maintenance. When you work Hipp Pools, we’ll make sure that your pool equipment is working properly, taking care of problems before they become repairs. This means ensuring that your filters aren’t putting too much of a strain on the systems and that your pumps are working properly. If your pool is in need of repair, don’t delay getting it fixed. The longer you wait to call for pool repair, the worse your water is going to get. That could mean that you will need a deeper, more expensive pool cleaning once the repair is taken care of. It’s also vitally important that you call for pool service if you hear anything strange coming from your pool equipment. If something is about to break, it can cascade into even bigger (and more expensive) problems. Whether you’ve had a pool for years and need pool repair, are unhappy with your current pool maintenance crew and need better pool cleaning, or are at the beginning of your pool design plans and want to find someone to help, we’d be honored if you contacted Hipp Pools today. We can handle all of your pool needs, and we’re excited to show you exactly what we can do for you. Contact us today to get your project or cleaning started! ©2019 Hipp Pools, Inc. | All rights reserved.